BitMart recently announced the partnership with BIT RACE LIMITED PARTNERSHIP Foundation. Sponsored by BIT RACE LIMITED PARTNERSHIP, we will officially launch an exclusive Bicoin Token (BCT) Project Sale Event on April 13th. Users will be able to purchase BCT with BTC. The secondary trading market will open within one month after the sale event concludes. To celebrate the launch of Bicoin Token (BCT) Project Sale Event, we will announce a series of promotion campaigns shown as below. During 04/09/2019 2:00 PM – 04/15/2019 10:00 AM (EDT), the top 10 users ranked by the number of referrals registered via their referral codes will each get a 70% off coupon. Only referrals who complete KYC will be counted. The coupon can only be applied to a maximum purchase amount of 300 USD. >>> Don't have an account? Register Now!!! Participants need to follow us on Twitter (@BitMartExchange), and retweet our post with �I want to participate in BitMart�s BCT Sale!� 5 winners will be drawn to win a 50% off coupon. The coupon can only be applied to a maximum purchase amount of 200 USD. 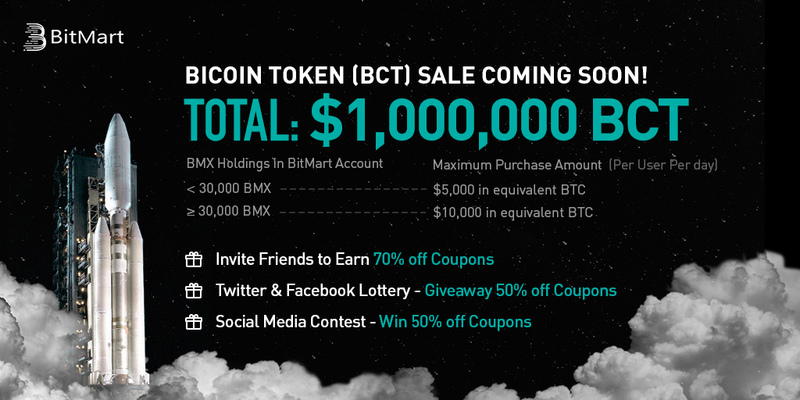 Participants need to follow us on Facebook (@BitMartExchange), share our post, and comment �I want to participate in BitMart�s BCT Sale!� 5 winners will be drawn to win a 50% off coupon. The coupon can only be applied to a maximum purchase amount of 200 USD. Participants need to submit the google form after posting some thoughts on social media regarding #BitMartBCTSale and collecting at least 30 likes. 5 winners will be drawn to win a 50% off coupon. The coupon can only be applied to a maximum purchase amount of 200 USD. Remember: The more creative your content is, the higher the chance you will win!